General Billy Mitchell is most notably known for his push for US military airpower. His unrelenting commentary on the subject led to one of the most famous court martials for insubordination and his consequential resignation from the US Army. William “Billy” Mitchell was born in Nice, France in 1879. Mitchell’s parents were part of an active political family from Wisconsin. Mitchell’s family returned to the Milwaukee area when he was three. In 1891, Mitchell’s father was elected to Congress, later assisting in Mitchell’s military career. He attended George Washington University in 1896 until the start of the Spanish-American War in 1898. Mitchell enlisted in the Army and shortly after received a commission in the Signal Corps with the assistance of his fathers congressional recommendation. Mitchell served in Cuba and the Philippians during the war. After the war Mitchell worked installing telegraph lines in Alaska . Mitchell witnessed a flight demonstration by the Wright brothers in 1904 that sparked his interest in air power. He joined the military with hopes of one day being a pilot. He received his chance in World War I. Prior to the entrance of the United States to the war, Mitchell had already been stationed in France as an observer. Mitchell served as the head of the Aviation Section of the US Signal Corps once the US entered. He started the war observing British and French air power, learning about their techniques and aircraft. Mitchell is credited as being the first American to fly over enemy lines in war. Throughout his 18 months of service in France, Mitchell coordinated the largest air-ground offensive of the war. He was promoted to Brigadier General and put in control of all American air combat units in France. Mitchell’s air power success in the war would later lead to trouble for him in the post-war period . Upon his return from war, Mitchell remained outspoken about the need for a strong air presence within the military. This was in the time of military disarmament between wars. Mitchell was assigned as the Assistant Chief of the Army Air Service and continued his airpower campaign by demonstrating how bombers could take out a naval ship, sinking the Ostfriesland in 1921. Mitchell staged the bombing of the captured German ship to demonstrate how air power is superior to naval power. His plan was first denied by the House Naval Affairs Committee, but after Mitchell went public with his commentary of the Navy calling ships “sitting ducks”, the house approved his plan in hopes of quieting in. In his fight to promote Mitchell, he made enemies by bashing the Navy. This demonstration embarrassed President Harding as Mitchell has pointed out a weakness of the US Navy. Aside from promoting air power, Mitchell was fighting for the creation of its own branch of the military, instead of just a section of the Army or Navy. For this reason, Mitchell is sometimes referred to as the father of the Air Force. 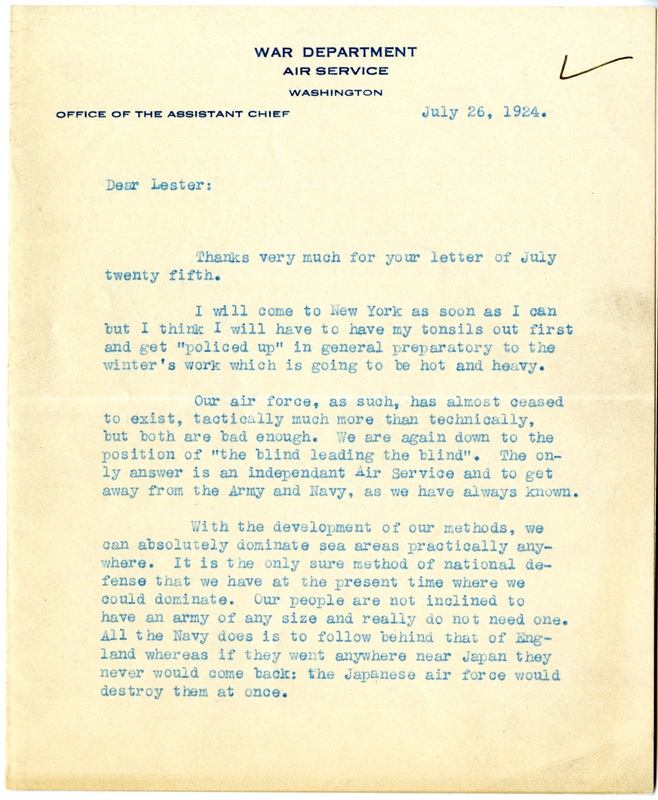 Letters Mitchell sent to a number of different individuals in 1924 have been uncovered in which Mitchell correctly predicted the rise of air power as well as correctly identifyied Japan as a threat. He even seemingly predicted the attack on Pearl Harbor, even specifically calling out the unprotected nature of the Hawaiian Islands . There has been vague speculation that Mitchell proved to the world the power of air superiority leading to the rapid technological advances that led to the Pearl Harbor bombing, but all signs point to the idea that Mitchell was not the only person aware of this. Mitchell claimed that European powers and Japan had a better air force than the US. In spite of Mitchell’s bombing demonstration, Pearl Harbor would have likely happened either way. In March 1925, Mitchell’s term as Assistant Chief of the Army Air Service ended. He was reassigned to the Army’s Eight Corps Area as the aviation officer at Fort Sam Houston in Texas. Mitchell viewed this as a demotion as the position came with a decrease in rank from brigadier general to colonel. Many of those that served under him continued to call him general and many of the lower ranking members in the Air Service respected him. To put down in words what the air men think about the organization of an air force and what our national defense should be. Next, to give to the people in general a book that will set before them facts about aeronautical development. And third, a book to which our people in the services, in the executive departments and in Congress can refer for data on aviation which is modern and which is the result of actual experience . The book created a bit of controversy. The original publication included political cartoons in poor-taste directed towards the Secretary of War, John Weeks. Weeks had been in poor health, creating controversy that Mitchell had targeted him in his book. Also, as later discovered in the preceding court martial, Mitchell had plagiarized a speech given by Captain Thomas Hart of the U.S. Navy. In October 1925, Mitchell had had enough with the senior officials in the military. The US airship USS Shenandoah crashed as a result of a storm, costing the lives of 14 crew members as well as the loss of three seaplanes flying from the West Coast to Hawaii. Mitchell accused senior officials of incompetence and treasonable actions of leadership while the Secretary of the Navy, Curtis Wilbur, used it as an example of the insignificance of air power and the US Air Services. Mitchell’s actions and outspoken behavior had finally reached its maximum. President Coolidge called for the court martial of Mitchell on eight specifications to be charged for . Mitchell was tried for violating the Article 96th of the Article of War, which prevents insubordination and critique of the military. Much of the reason for being tried under the Article 96 was for speaking to the reporters about the court martial. Two of the eight specifications he was charged with were directly from speaking to the media. Mitchell was defended by Congressman Frank Reid, who argued Mitchell had the right to free speech . The prosecutor argued that free speech does not belong in the military as it would interfere with the chain of command and create chaos. It turned into a trial of what millitary members are allowed to say and what they are not. The jury would have to set the precedence for where free speech ended and interference with the military started . The trial was also lengthened due to the call for new judges due to bias. Thirteen judges were involved in the trial, three of whom were removed, and none of them had any aviation experience. Contrary to modern court martial, an expert witness was not called to testify as the court did not recognize the fight for air power. Mitchell considered himself the leading expert in air power which lead to further tension in thr court room. On December 17, 1925, the final verdict was in: Mitchell was found guilty of violating the Article 96 after only three hours of deliberation. Mitchell would receive a suspension from command, duty, and rank with five-year pay forfeiture. The jury claimed lenience in the punishment as a reward for his actions in World War I. The vote had not been unanimous as it was reported that Major General Douglas MacAurthur had voted to acquit Mitchell. In response to the verdict and in recognition of his war-time contributions to the Army, Congress tried to reinstate him keeping his same rank as well as pay of his expenses. President Calvin Coolidge denied Congress’s request, but he did modify the original verdict. Coolidge changed the forfeiture of pay to half pay as Mitchell would not be able to search for other work while still employed by the military even though he was suspended from active duty. Instead of accepting the verdict, Mitchell chose to resign from the Army in 1926 . Mitchell continued to support airpower, even discussing with President Roosevelt on the subject. Even into 1934, Mitchell was still lecturing around the country on the current state of US air power. Mitchell accused private military aircraft contractors of purposely slowing aircraft improvement processes toincrease their profits from the government. Mitchell accused Elliot Roosevelt, the president’s son, of instigating this plan. The charges went to a congressional committee where Roosevelt denied all charges against him of lobbying for the contractors. Mitchell’s influence became significantly less after resigning from the Army. His means of receiving current up-to-date information had been severed . Just prior to his death, a house committee tried to reinstate Mitchell to retired status instead of resignation. Mitchell passed away in 1936 after a bout with the flu and is buried at the Forest Home Cemetery in Milwaukee, WI . Mitchell was posthumously promoted to Major General by President Roosevelt. In 1946, Congress posthumously awarded him the Congressional Medal of Honor. The North American B-25 Mitchell was named after him, being the only person to ever have an American aircraft designated after them. The Milwaukee county airport is also named after him: the General Mitchell International Airport. “General ‘Billy’ Mitchell Dead of Flu Attack Stormy Petrel of Air Corps Ill a Month” Chicago Daily Tribune, 20 Feb. 1936, pp. 1. Mitchell, William. Winged Defense: The Development and Possibilities of Modern Air Power—Economic and Military. G. P. Putnam’s Sons, 1925. Mitchell, Billy. Letter to Lester. 26 July 1924. War Department Air Service, Washington. Davis, Burke. The Billy Mitchell Affair. Random House, 1967. Davis, J. and O’Sullivan C. (Spring 2005). “A Question of Loyalty: Gen Billy Mitchell and the Court-Martial that Gripped the Nation,” Air Power History 52.1 73-74. Glines, C.V. (Sept 2007). “William ‘Billy’ Mitchell: An Air Power Visionary,” Aviation History. Maksel, Rebecca (July 2009). “The Billy Mitchell Court-Martial,” Air & Space Magazine. Ott, William (Winter 2006). “Maj Gen William “Billy” Mitchell: A Pyrrhic Promotion,” Air & Space Power Journal 20.4:2-33.